She is one of America’s Hollywood blue-eyed beauties that have shown her talents in acting as well as film producing and directing. 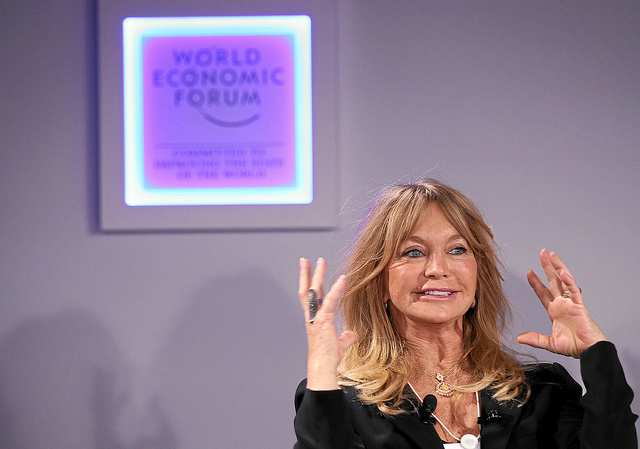 Goldie Hawn is an Academy award winner that has been in the industry for nearly forty years. Goldie Hawn was born on November 21, 1945 in Washington, D.C. to mother Laura (née Steinhoff), and father Edward Rutledge Hawn, a band musician who played at major events in Washington. She had two siblings a sister, Patricia and a brother, Edward, who died before she was born. Hawn was raised in Takoma Park, Maryland. Hawn took ballet and tap dance lessons at the age of three, and danced in the chorus of the Ballet Russe de Monte Carlo production of The Nutcracker in 1955. She made her stage debut in 1961, playing Juliet in a Virginia Shakespeare Festival production of Romeo and Juliet. In 1963 Hawn graduated from Montgomery Blair High School and went on to attend the American University majoring in drama but dropped out in 1964 and began tutoring in a ballet school. She made her professional dancing debut in a production of Can-Can at the Texas Pavilion of the New York World’s Fair and began her professional dancing a year later, appearing as a go-go dancer in New York City. Hawn launched her acting career in 1967 with a role in Good Morning, World. She received international recognition, with her role on the sketch comedy show Rowan & Martin’s Laugh-In. In the late 1960s and early 1970s Hawn made film appearances in Cactus Flower for which she won an Academy Award for Best Supporting Actress, There’s a Girl in My Soup and Butterflies Are Free. Following her Academy Award win, Hawn appeared in the successful comedies There’s a Girl in My Soup (1970), $ (1971), Butterflies Are Free (1972) and Shampoo (1975). She also starred in the satirical dramas The Girl from Petrovka and The Sugarland Express both in 1974. Her 1978 television show The Goldie Hawn Special was also nominated for a prime-time Emmy. Hawn’s feature film release Foul Play with Chevy Chase, became a box office smash however her next film, Mario Monicelli’s Lovers and Liars (1979), was a box office failure. Hawn’s success grew with good film choices such as Private Benjamin (1980), Seems Like Old Times (1980), Protocol (1984) and Wildcats (1986) (Hawn also served as executive producer on the latter two) and dramas like Best Friends (1982) and Swing Shift (1984). After a slow period Hawn’s career kicked off again in 1990 with the action comedy Bird on a Wire, where she starred alongside megastar Mel Gibson. She went on to do the thriller Deceived (1991) and the drama CrissCross (1992), and critically praised film Death Becomes Her (1992). Her role in HouseSitter (1992) was also a commercial and critical success. Further recognition came with The First Wives Club, opposite Bette Midler and Diane Keaton. Hawn’s later movie roles were below par and with her last film appearance being in The Banger Sisters (2002), opposite Susan Sarandon and Geoffrey Rush. Goldie Hawn is the mother of Hollywood siblings Oliver and Kate Hudson. Her first husband was Gus Trikonis and her second was Bill Hudson who fathered her two children. She has been involved with actor Kurt Russel since 1983. Together they have a son Wyatt Russell who was born on July 10, 1986 and Hawn is stepmother to Kurt’s other son Boston. She is a proud grandmother to Ryder Robinson and Wilder Hudson.